IMPORTANT: Electronic authorisation will become mandatory for declarations in some forms on 28 April 2014. IRAS now offers the facility for electronic authorisations as an alternative to ink signatures on hard copies. Except where ink signature is a legal requirement it will be possible for Principal Investigators, radiation experts, sponsor representatives, educational supervisors, etc to "sign" declarations by giving an authorisation on a form generated through IRAS. This avoids the need to take or post paper copies of forms to the various individuals who need to authorise information in applications. Electronic authorisation is an option that may be used where convenient, but ink signatures may still be used where preferred [***electronic authorisations may be mandatory for declarations for some application forms. Please check the updates area of the IRAS homepage for latest information***]. There is no need to obtain both ink signatures and electronic authorisation. The system works by means of a secure transfer between the project owner and the person giving authorisation ("the authoriser"). The authoriser receives an email through IRAS asking them to authorise an application. 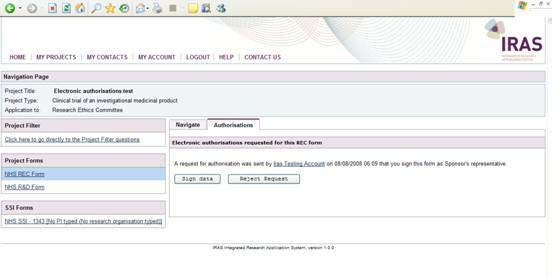 The authoriser logs in to IRAS and is able to review the application and then clicks to authorise or reject using a button. This creates an auditable record on the system of what has been authorised, when and by whom. IRAS then sends an email back to the applicant (project owner) confirming authorisation. Please note that all authorisations other than radiation authorisations apply to a specific application and not to the whole dataset. The appropriate form, e.g. the R&D form, must be selected in order to access the authorisation function. Applicants must obtain the relevant authorisations before selecting "Proceed to Submission". This is a different order to the process used for ink signatures. Applicants need to get the authorisations first so that all the authorisations are included in the form which is then saved and printed. If the applicant makes changes to the data after authorisation, the authorisation is invalidated, so there is no possibility of applicants submitting forms that have been changed after authorisation. On the main navigation page, the applicant selects the relevant form that requires authorisation from the links under Project Forms, e.g. the REC form (do not select the full project dataset as this does not have an authorisation function). The applicant selects the "Authorisations" tab on the right hand side of the main navigation page. The tab will indicate all the authorisations that are required for that form, for that particular project. The applicant selects the relevant type of authoriser (e.g. sponsor) and clicks the "Request" button. The applicant enters the e-mail address of the authoriser and clicks "Send Request". The tab now shows the authorisation that has been requested. The authoriser will receive an email from IRAS requesting that they authorise the form, with a link to log in. When the authoriser logs into IRAS the main project page will now contain a "Requests for Authorisation" section below any projects they own. The authoriser clicks "Open Request". The main navigation page shows the relevant form. 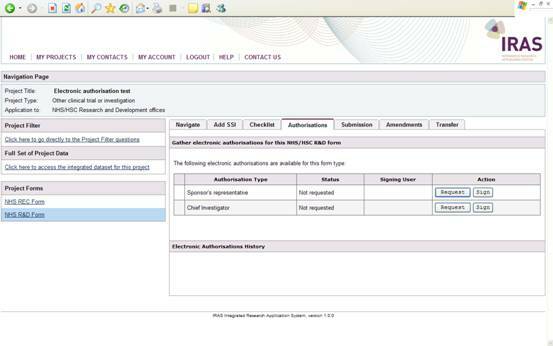 Only the "Authorisations" tab is visible, showing details of the authorisation required. The authoriser clicks "Review Requested Form". The main navigation page now shows the "Navigate" tab. The authoriser clicks on the "Navigate" to view the application data in read-only format. If the authoriser is happy with the form, the authoriser clicks "Authorise Form". When "Authorise Form" is selected, the authoriser is prompted to enter details including their username and password, then clicks "Sign". This acts as an extra layer of security to ensure that only the registered authoriser can electronically authorise an application. The applicant will receive an email from IRAS confirming the authorisation. They can now navigate to the relevant section of the appropriate form. The declaration section will now contain the text: "This section was signed electronically by [name] on [date, time]". Alternatively the authoriser can select "Reject Request". The applicant will receive an email from IRAS confirming that the request to authorise was rejected. The applicant should liaise directly with the authoriser to resolve the issue. The applicant must select the relevant form to request authorisations. If the project involves radiation, authorisations from reviewers of the radiation information need only be obtained for one form. The authorisations will cross-populate to all other forms requiring these authorisations (REC Form, R&D Form, ARSAC Forms). The data from Part B Section 3 is available in read-only form in the ARSAC form and e-authorisation of a main form therefore also applies to any ARSAC forms generated. The ARSAC form also contains one site-specific question which is not part of the e-authorisation. Any change to the data in the radiation section (Part B Section 3) will invalidate the authorisations in all forms. The revised information will need to be re-authorised, and submitted as an amendment to any bodies that have reviewed the information. The applicant must complete all the fields in a form or the relevant sections of a form before requesting authorisation. Do not print for submission to get a submission code on the form until after the authorisations have been obtained. Electronic authorisation can only be performed by individuals who have an IRAS account, and their registered email address must be used in requesting authorisation. Applicants should check this with authorisers before attempting to request electronic authorisation. If data in an application is changed after any electronic authorisation, that authorisation is invalidated by the system. If one authoriser requires changes to data that have been authorised by others, all the authorisations will need to be requested again before the form can be submitted. If a review body requests a re-submission of an application, all the authorisations will need to be requested again before the application can be submitted. A Chief Investigator who is also the owner of the project on IRAS can authorise by clicking the "Sign" button. Similarly an authoriser who also needs to enter information into a transferred application, e.g. radiation authorisers, can have a form transferred to them and then select the "Sign" button. This avoids the need for a separate process for completing and authorising information. Any authorisation that has been requested incorrectly, e.g. if the data is not complete, can be revoked at any time by the requestor, using the "Revoke" button available on the authorisation tab.